For a Brighton band* Fear of Men don’t play that much in Brighton. So far this year, they’ve played as part of the Sea Monsters mini-festival, and also played a set during The Great Escape, so their support set for Best Coast is the first opportunity of 2012 to see them on a decent sized stage. The band have been supporting Best Coast for most of their UK tour, which is a bit of a coup for a band with only a clutch of singles to their name so far, and the homecoming gig is also the final date of the tour. It was an early gig anyway, because of a club night later on at Coalition, and Fear of Men’s set started at a ridiculously early 7.15pm, but by then the venue was already getting busy. 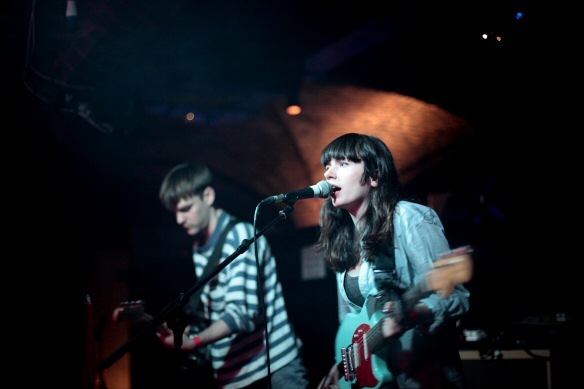 For about half an hour, they filled a few seafront arches with their melodic guitar pop – catchy, tuneful melodies with fuzzy guitar around the edges, owing as much of a debt to Sarah Records releases of the late eighties as it does to the wave of female fronted indie bands of the nineties – songs that might not fill stadiums, but that you’ll form much more of an emotional attachment to. It’s a similar trick to that played by Pains of Being Pure at Heart – the familiarity of alternative music from the past but pulled off with a modern style that they make their own. In no time at all, the band are closing their set with new single Green Sea. I reckon it’s about time they came back and played a headline set. Later on, Spectrals from Leeds plays for a bit (sad songs, because they were one man down, apparently), and then Best Coast headlined. They started nervously with the lead track from their new album The Only Place, but quickly hit their stride rattling through their back catalogue, finishing up with Spectrals joining them onstage for their last track – a tradition which apparently started last time both bands played in Brighton. A great night! *well, partly Brighton – some of them are Londoners, but they’re that good that we’ll keep them for ourselves. 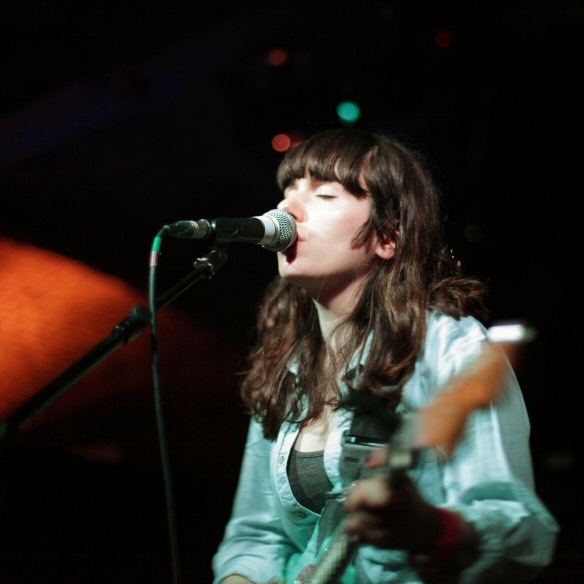 This entry was posted in Uncategorized and tagged Blog, Brighton, Coalition, Fear of Men, Jess Weiss, Jessica Weiss, Live, Music, Review, Spectrals, tour by brightonmusicblog. Bookmark the permalink.